In my excitement in writing about Micro League Baseball last week, I neglected to point out that Greg Holcombe went 10 for 10 in “Triple Crown TWIBia”. Even though Greg submitted 1996 Rusty Greer for choice #8 while I was looking for 1975 Ted Simmons, they had identical Triple Crown numbers. So Greg, you get awarded full credit, extending your streak to 35 for 35 which officially puts us on the Greg Holcombe watch. I also want to give a shout out to Jessica Kuethman who got 6 out of 10 correct, while also listing Greer. Good job, Mrs. Kuethman. As for the rest of you kind readers, I ask you to feel free to write in to twib@mlb.com and I’ll get back to you either in email, or maybe even in the broadcast of the show in the revamped TWIB Notes. No question or comment is too big or small, so chime in and your voice will be heard. I hope you’re able to catch this week’s episode of TWIB, which features the Kansas City Royals. After scuffling for most of this decade, the ball club in the town of BBQ looks like it’s beginning to turn the corner with the young talent of Alex Gordon and Billy Butler, a talented top of the rotation in Gil Meche, Zack Greinke and Brian Bannister, an ace closer in Joakim Soria, and a manager who seems to be the perfect man for this group in Trey Hillman. We spend extra time with Bannister as he shares his love of photography around scenic Kauffman Stadium, which is one of the most underrated ball parks in the league. I hope they can put it all together and become a real contender this season, because the Royal franchise should be thought of as a winning organization. I’ll never forget those great Royals teams of the 70’s and 80’s – George Brett was the man. With a nod to their glorious past, we also take a look back at the Royals heated rivalry of that era with the New York Yankees. You may be surprised to see how aggressive they got on the field, chucking more haymakers than Hacksaw Jim Duggan and Rowdy Roddy Piper in a WWF bout, making the current NY – BOS one look pretty tame in comparison. Of course, the ultimate KC – NY showdown has to be the infamous “Pine Tar Game” – Goose Gossage, Billy Martin, and a livid George Brett throwing a first ballot Hall of Fame tantrum. I’ll never forget that game because I was there, and I have the ticket stub to prove it. I was 9 years old sitting in the lower third base section in Yankee Stadium when Brett came screaming out of the dugout, and while I didn’t fully grasp all of the events that went down, I loved every minute of it. You can check it out for yourself in our bonus footage section. It’s a fun show, and we’re happy to present a team that doesn’t get their fair share of national exposure. team, drafted by me when I was 13 years old. and which rattle meant you had to reboot. Once you had Micro loaded, the baseball world was your oyster. Carew slashed a hard single to right field to keep my club alive. went crazy. That sent Mickey Mantle, the 1989 Micro MVP, to the plate. bases, scoring Clemente with an unlikely back-to-back triple. Tie game. minutes, print out in-depth draft sheets, and post results on the web. weighed in on what type of player they are for the present and future. doesn’t matter who they play for in real life. They’re playing for you. favorite MLB club winning the World Series. 7 – lost their bid for a fourth straight title. They haven’t won since. And I don’t have a single regret. No TWIBia this week, but send any comments or suggestions to me at twib@mlb.com. 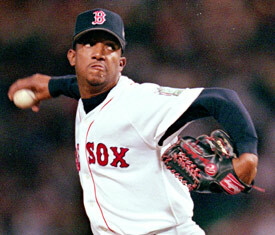 Pedro in 1999 (Ezra O. Shaw/Getty Images). anywhere else. Hopefully you’ll enjoy those two pieces this week. Grove, and were told you can’t compare pitchers from different eras? Snell) because the ERA of Coors Field was 4.79.
his league average ERA was 2.96.
debates: who was better, Tom Seaver or Greg Maddux; Koufax or Grove? Before we get too excited, *ERA+ is not all encompassing. Last week, hoped you guessed it, I was paying homage our show’s subject, the Phillies. At press time, Greg Holcombe was our lone 5 for 5 contestant from last week. He’s now 15 for 15 overall. batting crown in MLB history. eclipsed until Andres Galarraga tallied 150 in 1996. MVP voting to Larry Walker. as ****. Only Alex Rodriguez has more 40 homer seasons as a shortstop. Phew, that was a lot to get through. Now I don’t have time to write about much else! I’ll keep the TWIBia to 5 for this week. I hope you continue to tune in each week, and thanks for checking the website. As always, you can email us at twib@mlb.com with questions, suggestions, and of course your TWIBia answers. 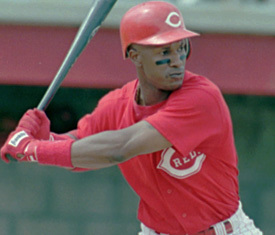 Eric Davis in his 1996 comeback (James A. Finley/AP). Today stats are more readily available than ever before. 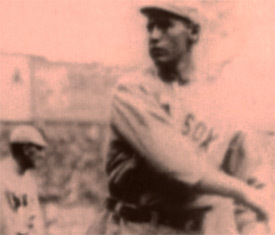 automatically to the page of Lou Gehrig, Ted Williams or Eric Davis. honor of presenting “This Week in Baseball” to you every Saturday. that Macmillan Encyclopedia, we’ll have some fun with some raw numbers. guesses for the players and year and email me at twib@mlb.com. Good luck, have fun with it, and see you next week.